Alex is a native of Swansboro, North Carolina. As a child, she grew up sailing, fishing, and canoeing in the waters surrounding her small coastal town. She attended camp in the summers where her favorite activities were searching for shark teeth along the shores of the inlet and fossil hunting in a large pile of shells at the nature cabin. Her initial interest in natural resources was put on the back burner while she chased her dream of collegiate athletics. This dream led her to the University of North Carolina at Asheville where she became a member of the women’s Track and Field team. While attending school in the rolling mountains of Western North Carolina her old love of all things nature was reignited. This love led her to pursue a B.S. in Environmental Studies with a concentration in Earth Science with which she proudly graduated in 2017. While obtaining her degree she had the privilege to be accepted as a McCullough Fellow with the McCullough Institute for Conservation, Land Use, and Environmental Resiliency. As a fellow, she completed undergraduate research in collaboration with RiverLink. Her project focused on community-engaged research while predicting and mapping soil erosion along a tributary of the French Broad River. She is thrilled to be back a RiverLink serving as volunteer coordinator where she can continue work on revitalizing the French Broad and connecting with the great community of Western North Carolina! When she’s not working with RiverLink you can find her spoiling her dog, hiking, or spending time with family and friends. Rhys is a North Carolina native, where her best memories were formed on trips to the mountains. She received a chemistry degree from Warren Wilson College but took perhaps more pride in serving as the shepherd on the school farm. Rhys fell in love with western North Carolina long ago, but she is now thrilled to discover even more of it while serving as the Forest Keeper Coordinator for MountainTrue. In her free time, Rhys loves cooking, road tripping, social dancing, and hanging out with farm animals. Jeffrey is a native of Raleigh NC but calls the mountains of NC his home away from home. Growing up in the “Big City” he had many opportunities to visit and explore the captivating museums of the area, this is where he developed his love and passion for the natural world. He continued to grow his curiosity in this field of study when he attended the University of North Carolina at Asheville, where he graduated with a B.S degree in Environmental Studies in 2016. Jeffrey built on his knowledge of natural resource conservation by participating in two AmeriCorps programs in 2017 and 2018. He served with Knox County stormwater management in Knoxville TN as well as American Conservation Experience’s Southeastern branch in Asheville NC. He is currently serving at Mainspring Conservation Trust in Franklin, NC through AmeriCorps Project Conserve. He will manage habitat for wildlife and rare plants, improve existing and planned trails, and educate the public through interpretive materials and educational events. Jeffrey will also help lead aquatic biomonitoring projects. These are just a few of the tasks he will be performing while serving with this organization. He plans on applying for graduate school in the fall of 2019 in an Environmental Science program TBD. Olivia grew up in Asheville, North Carolina. She always had an interest in the outdoors, but her passion for environmental sustainability began at Appalachian State University, where she received a B.S. in Sustainable Development with a focus in environmental studies. 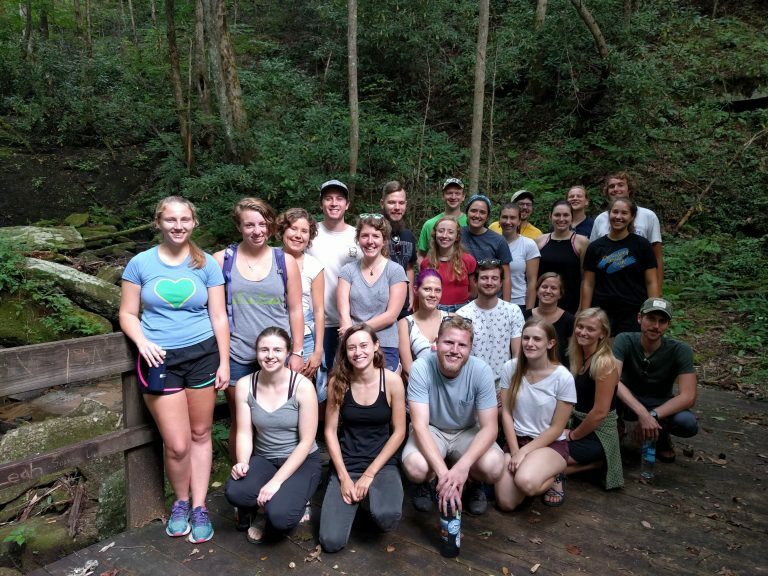 An internship at Appalachian Voices made Olivia realize she wanted to work in environmental nonprofits, and since moving back to Asheville, she has been searching for a way to promote sustainability in WNC. This led her to Americorps Project Conserve. Olivia is excited to serve as the Community Engagement Associate for Conserving Carolina for a second term. In her free time, you can find her hiking, adventuring to swimming holes, seeing live music, or borrowing a friend’s dog for the day. Garret grew up in the small town of Jefferson, Georgia located in northeast Georgia. He graduated from the University of North Georgia in the small mountain town of Dahlonega, where he attained his Bachelor’s in Political Science. He will be working as the Outreach and Education Coordinator for Mills River Partnership and is very excited to be moving to Asheville. He discovered his passion for environmental conservation his past 2 years studying political science. Outside of school and work he enjoys discovering new things outdoors, trails, rivers, kayaking, local coffee shops, and restaurants. Jason grew up on the Space Coast of Florida where he received a degree in digital media and TV production from Eastern Florida State College. His video production skills made possible three treks to Nicaragua in order to document mission trip service. It was there that Jason realized how important service to others is. After moving to Western North Carolina, Jason earned his bachelor’s degree in Environmental Studies with a Sustainable Agriculture concentration from Warren Wilson College in Swannanoa, NC. Project Conserve seems like a perfect fit for Jason to gain more real-world experience while serving people in the Polk County community. He is most excited to be a part of the Farmland Preservation Program that he will be a part of! In his free time, Jason plays racquetball, rides his motorcycle and raises chickens with his wife. Gabby was born in California and grew up exploring all over the southeast. When her heart called her to the mountains, in 2015, she packed up and moved to Asheville, NC. Since then, she has completed her B.S. in Environmental Science with a concentration in environmental management and policy and a minor in economics from the University of North Carolina at Asheville. Gabby found she had the calling to work towards serving others and protecting the beautiful places we love after an internship with Asheville GreenWorks, time spent teaching hula hoop fitness, and working with disaster relief organizations. In her free time, Gabby can be found hula hooping, camping, and exploring waterfalls and trails all around WNC. She is excited to serve as the Community Forestry Coordinator for Asheville GreenWorks because she will be able to connect with the people and places she loves the most. Israel Golden grew up a pastor’s kid in and around the foothills of Charlotte, North Carolina. There he spent his halcyon youth chasing after reptiles and, in the Summers, exploring the forests of Western North Carolina. After high school, he matriculated at UNC Asheville where he studied Biology, Spanish, and Environmental Studies. His undergraduate research project concerned determining the origin and subspecies of an invasive Boa constrictor population in the US Virgin Islands. Upon graduation, he rode his bicycle across the United States to raise money for various organizations including the Southern Appalachian Highlands Conservancy. His passion for conservation and love for WNC led him to get involved with Project Conserve. This year Israel will be serving as the Conservation Education and Volunteer Outreach Member at the Southern Appalachian Highlands Conservancy. Through this position, he hopes to build lasting, personal relationships between WNC community members and the natural world. Israel enjoys playing music, telling ghost stories, and riding bicycles. Elizabeth was born and raised in Detroit, Michigan. Her love for the outdoors stems from the summers she spent with her grandparents in Jalisco, Mexico playing in the mud and with the farm animals. Elizabeth earned a B.S. in Anthropology with minors in Ecology & Evolutionary Biology and the Environment from the University of Michigan. After spending a summer at the University of Michigan’s Biological Station taking classes and doing field work, and a summer internship at the university’s botanical gardens, she discovered that her ideal work environment is outdoors. Elizabeth will be serving as the Citizen Science Assistant at the Great Smoky Mountains and is very excited to live in the mountains and learn more about WNC. When not working you can find her lost in a book (or bookstore), backpacking, journaling, or scrolling through Instagram dog accounts. The foothills of the Blue Ridge Mountains serve as the primary habitat for Logan, and the town of Elkin, North Carolina set the stage for a life devoted to caring for the environment. With a degree in Parks, Recreation, & Tourism Management from NC State University, Logan’s interests lie with protecting our landscapes while promoting their opportunity. Such opportunity allows for recreation, rejuvenation, and essentially, a re-connection to the natural world. Sharing and exciting the value of conservation is Logan’s mission, and joining the greater team at Project Conserve is sure to exercise that. Logan will serve as a Trails Associate at Conserving Carolina. Following consecutive seasons as a Trails/Wilderness technician with the US Forest Service in Oregon and Northern California, he is thrilled to bring his passion home. Logan enjoys wandering down trails and streams, and also likes cooking, storytelling, playing the didgeridoo, and listening to music worth jamming to. Hanusia Higgins grew up in central Pennsylvania. Through participating in an environmental competition club in middle school, she discovered that she could combine her dual loves of science and nature by studying environmental science and ecology. Accordingly, she recently graduated from Washington University in St. Louis with a bachelor’s degree in biology, ecology, and evolution and a minor in environmental studies. Hanusia is especially interested in invasive species management, so she’s thrilled to be serving as the Stewardship and Volunteer Engagement Associate with the Hemlock Restoration Initiative. 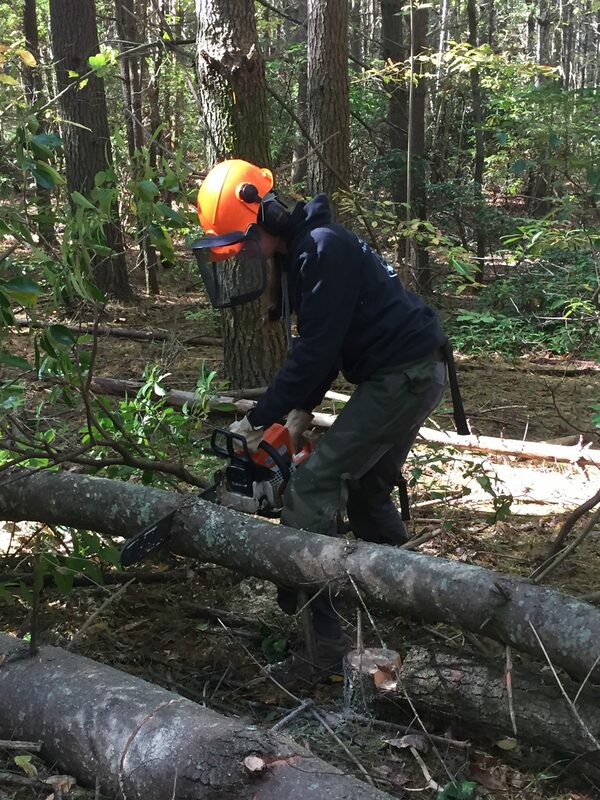 In this role, she is looking forward to working hands-on to conserve the hemlocks of western North Carolina and getting to know the local community. When she’s not picking up plastic bottles and muttering to herself about recycling policies, Hanusia enjoys cooking, baking, biking, and hiking. Kelly Holland grew up in Maryland, where she fell in love with nature’s small beauties in her parent’s backyard garden and on the banks of the Potomac River. Following a passion for the arts, Kelly received a Bachelor of Fine Arts degree from Salisbury University and a Master’s degree in art education at the University of Maryland. After teaching visual art for several years, she was drawn back outside to a position in Outdoor Education. She has since relished the opportunity to introduce communities to the importance of environmental preservation and the joys of outdoor adventure and hopes to continue to do so as the Community Outreach and Education Associate for Conserving Carolina. Kelly is thrilled to make western North Carolina her home through Project Conserve and cannot wait to explore. Kelly spends her free time along any river she can find – whitewater kayaking, hiking, creating art, and hunting for insects. Max was born and raised in North Carolina, calling Chapel Hill his home until he left for college. He attended Denison University in Ohio where he earned a B.A. in environmental studies and a minor in geoscience. He gained a great appreciation for environmental service through his internship at Triangle Land Conservancy and interest in conservation. Knowing he wanted to return to North Carolina after graduation, he looked towards western North Carolina for an experience in the mountains where he served his first term in Project Conserve. He is excited to continue his service for a second term as Habitat Restoration and Volunteer Coordinator at Conserving Carolina. In his free time he enjoys swimming, disc golf, biking, and watching college basketball. Shelby was born and raised in Lake Wylie, SC. From an early age she has loved being outside and thrived in the water; spending every summer of her childhood on the swim team and in the lake. This fueled her passion for environmental stewardship especially issues pertaining to the conservation of water bodies. During her time at Winthrop University receiving her bachelors in Environmental Studies, she developed an interest in the environmental education of youth. After university, she moved to New York City and stumbled upon Americorps. Through New York’s Civic Corps program she served her first term as the Education Coordinator for the Gowanus Canal Conservancy where she was able to work with inner-city youth in an urban aquatic environment. However, the mountains of Western North Carolina were calling her name so she moved to Asheville and again stumbled upon Americorps. Shelby will be serving her second term as the Water Quality Coordinator for Asheville Greenworks and is excited for the opportunity to work on the water again gaining new skills and experience. In her spare time, you can find her reading books in her Eno, listening to the classics, and spending time outdoors in various capacities. Cate spent her childhood on Bainbridge Island, WA, where proximity to the Olympic Mountains, Pacific Ocean, and everything in between sparked her passion for landscape ecology and conservation. She followed these interests at the University of Oregon where she earned degrees in Biology and Environmental Science while researching the effects of climate on farmland microbe conditions. She is excited to continue serving and learning with Southern Appalachian Highlands Conservancy for a second year as a Stewardship and Volunteer Associate. When she isn’t wandering off trails in search of birds, you can find Cate trail running, rock climbing, or spending some quality outdoor time with a sketchbook. Carrie is from northeast Georgia and grew up exploring the beautiful Blue Ridge Mountains near her home. She attended the University of Georgia for her Bachelor’s and Master’s degrees and recently completed her Ph.D. in Geospatial and Environmental Analysis from Virginia Tech. Her dissertation research examined headwater stream length dynamics across the Appalachian Mountains. Inspired by the implications of her project for environmental policy and watershed conservation, Carrie is excited to join the Environmental Quality Institute as the Stream Monitoring Coordinator with Project Conserve this year. Outside of work and school, Carrie may be found running, road biking, painting, raft guiding, or hiking to favorite swimming holes. A WNC native, Jess grew up exploring the natural wonders that attract so many to the region. Her love of science and barefoot adventures lead her to the University of North Carolina at Asheville to study environmental studies, concentrating on management and policy. She developed a particular passion for environmental education and held a variety of related positions, including a Naturalist at Chimney Rock State Park. She is excited to join the Foothills Equestrian Nature Center as an Environmental Education Associate and the opportunity to reach students across Western North Carolina with lessons teaching the importance of environmental stewardship. She hopes to further develop her skills in environmental education at the nature center and finish her North Carolina Environmental Education Certification. When she is not connecting children to nature, you can find her enjoying live music, traveling, creating art, spending time with friends and hiking with her dog Copper. Lianna grew up on a hobby farm in Mankato, Minnesota building forts in the woods, running around barefoot, and chasing chickens. She graduated from Warren Wilson College in Asheville, North Carolina where she studied Environmental Education, worked on the Fiber Arts Crew and a Construction Crew, and ran Cross Country. She discovered a passion for pollinators while working as a Naturalist at Itasca State Park, and is excited to participate in various butterfly projects as the Citizen Science Education Specialist at the NC Arboretum. Outside of work, Lianna enjoys hiking, trail running, visiting National/State Parks, knitting, and sewing. Julia is an Asheville native and graduate of UNC Asheville, where she majored in Environmental Studies. During college, she completed a NOLS semester, visited the Galapagos Islands and Amazon Rainforest with a study abroad program, conducted research as a McCullough fellow, and worked for UNCA Outdoor Programs. She recently spent seven months in Ecuador, where she studied Spanish and volunteered at a women’s shelter overseeing compost and garden projects. She is currently completing her 200-hour Yoga Teacher Training. Besides yoga, Julia is passionate about cooking plant-based food, travel, and reading. Julia is thrilled to be working at Asheville GreenWorks as the Waste Reduction Education Coordinator and sees Project Conserve as an opportunity to develop skills which will support a lifetime of environmental service. She is excited to learn, listen, and contribute to the waste reduction movement with an emphasis on lowering recycling contamination and diverting waste from landfills. Shannon Lally grew up in Greenwich Connecticut, a suburb of New York City. She first visited the Blue Ridge Mountains when she was a 12-year-old attending sleep-away camp. Ever since that summer, Shannon has fostered a love of nature and our local wilderness. In 2015, Shannon made the move from Connecticut to North Carolina where she attended the University of North Carolina Asheville, majoring in environmental studies with a concentration in management and policy and a minor in economics. Over the past year, Shannon has worked for UNCA’s Office of Sustainability, in order to familiarize herself with local needs. Shannon is excited to begin her service year with the Transylvania County Cooperative Extension as their Outreach Coordinator. She hopes that her time working with the Cooperative Extension will further her understanding of her adopted community. Shannon is dedicated to becoming a resource and advocate for partnerships focused on agriculture, food, health, and 4-H youth development. In her free time, Shannon enjoys hiking with her dog Baxter, camping, traveling, attending local lectures, and gardening. Whisper grew up in the low country of Charleston, SC where she first learned about herbalism from her grandmother. Later, when life took her family to a more urban environment she knew that that was not for her. Whisper found her way back to the woods first leading group hikes and cycle rides in Charlotte, NC and then working as a raft and kayak guide. These days she spends her time volunteering with a non-profit group that welcomes disenfranchised youth and veterans into National forests to help clean up green spaces and foster community. Whisper has had a lot of experience working with intentional communities committed to renewable energy and living off the land. Whisper joined AmeriCorps Project Conserve to support her local community and help share the importance of conservation with those who would otherwise have no idea about it. She is hoping to help younger generations grow up with a strong sense for sustainable living. Whisper also has a deep love of yoga and is raising her daughter in yogic and wise women traditions as part of this endeavor. Catie grew up in Waxhaw, North Carolina and graduated from Davidson College in 2017 with a B.S. in Environmental Studies and Hispanic Studies. During her first semester in college, she took a wilderness leadership skills course on a whim and discovered a love of the outdoors, particularly as a space to connect with people, teach leadership, and build community. She expanded this interest into her studies, doing research on the impacts of land use on stream and ecosystem health and on the socioeconomic impacts of national park closures on local communities. Catie is returning from a year working for an environmentally-focused study abroad program in Costa Rica, so she is excited to bring what she learned back to North Carolina and serve as the Outings and Education Coordinator for MountainTrue. When she isn’t walking around with a mug of tea or reading outside, you’ll find Catie climbing, quilting, or trying to find ways to keep speaking Spanish. Hannah Phillips was born and raised in the small town of Belmont, North Carolina where she spent most of her time training as a pre-professional classical ballet dancer. Upon graduating high school, she chose to leave her dance career behind to pursue a life devoted to environmental conservation. Hannah recently graduated from the University of North Carolina at Asheville with a Bachelor’s degree in Environmental Studies concentrating in Management and Policy. She discovered her passion for habitat restoration while working on several projects focused on protecting ash trees in western North Carolina and management of non-native invasive species. She will be serving as the Habitat Restoration Associate for Conserving Carolina. In this term, she is excited to continue working to promote native biodiversity around the mountains that have become her home for the last 4 years. In her free time, Hannah enjoys skateboarding, traveling, and spending quality time with her dog, Dixie. Emily Powell grew up in Lancaster, Ohio and from a young age, she was taught an appreciation for nature. Emily graduated from Ohio University where she studied Field Ecology with a focus of Plant Biology. Before moving to North Carolina, she worked as a Stewardship Assistant with the Ohio Natural Areas and Preserves Association doing habitat management & restoration of nature preserves across the state. She loved doing this work and is thrilled to now be the Stewardship Associate for Conserving Carolina! She hopes to continue learning about plants, conservation, and sustainably managing the natural land in WNC. In her free time, she enjoys hiking, yoga, art projects, and foraging. Emma Rast grew up in Lancaster, Pennsylvania where she spent much of her childhood reading in trees, exploring the outdoors, and camping at various bluegrass and old-time festivals. She attended Oberlin College, majoring in biology and environmental studies and discovering a particular interest in plant ecology and conservation. This will be Emma’s second term with Project Conserve. 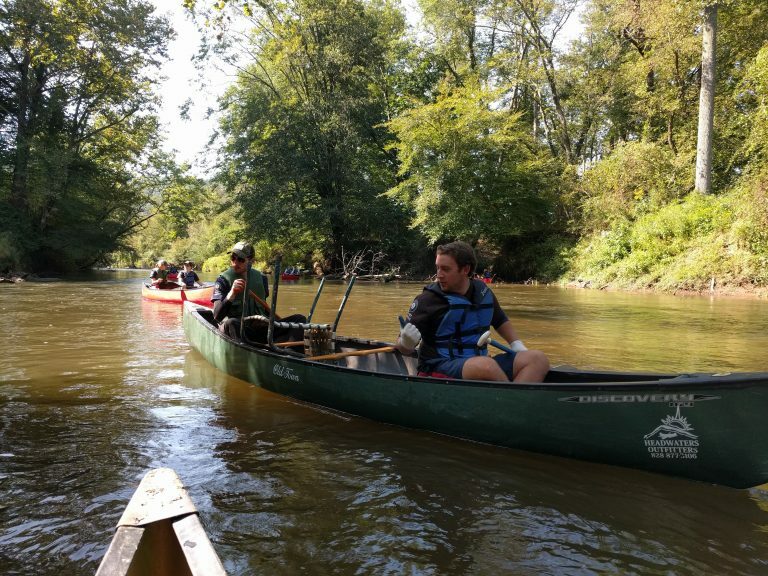 She spent the past year exploring, learning, and caring for the French Broad Watershed as the Volunteer Coordinator with RiverLink. This year she is excited to continue learning and caring for beautiful WNC, serving as the Stewardship and Volunteer Associate at Southern Appalachian Highlands Conservancy. Emma enjoys playing music, reading in the quiet of the morning, and hiking around WNC among all the amazing plants of the region. Anne is from Arundel, Maine where her love for the outdoors began. She grew up on a farm and began participating in sustainable agriculture projects near her college town of Worcester Massachusetts. After traveling to volunteer on a coffee farm in Northern Peru, she started to develop a passion for environmental sustainability and land conservation. In completing a B.A.in International Development and Social Change at Clark University, she became interested in ways to not only stay invested in international social issues but to stay involved in the Worcester community around her as well. She continued on to receive her M.A. 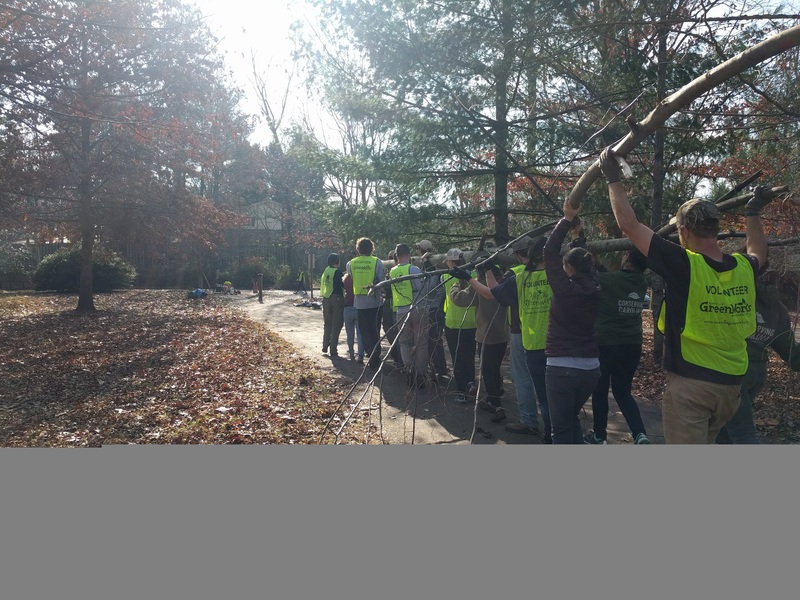 in Community Development and Planning from Clark University and participated in the land conservation efforts that were happening in Worcester. After interning for the Greater Worcester Land Trust, Anne realized that she wanted to work within the nonprofit sector to focus on environmental stewardship and advocacy. This led Anne to transition to Asheville, North Carolina to serve with Americorps Project Conserve as the Watershed Resources Coordinator for Riverlink. You can find Anne whitewater rafting, backpacking around the Blue Ridge Mountains, or climbing at the local rock gym. Larissa Robinov is originally from New York City but has found that she prefers a more rural lifestyle. She moved to Asheville, earned a B.S. in Biochemistry from Warren Wilson College and has since had jobs working in forestry both as a technician in Vermont and a researcher in Alabama. She also had the opportunity to research agricultural methods in rural China. She is happy that Project Conserve has connected her with the Southern Appalachian Highland Conservancy because she is excited to be a part of the work they do as the Land Protection and Education Associate. In her free time, Larissa loves to cook, read, be outdoors, and spend time with good people. Lucy grew up in Houston, Texas. She attended the High School For Performing and Visual Arts where she studied violin. She graduated with a Bachelor’s degree in Environmental Studies with a concentration in Conservation Biology from Warren Wilson College. She worked on the Garden Crew where students harvested a percentage of the vegetables for the school cafeteria and used biodynamic practices. The summer before her senior year, she went to Panama and Brazil working on ecological projects through Wildlife Conservation Society and a class trip. After college, she worked in the Cuyahoga Valley National Park as a botanical intern. In the park, she enjoyed working with volunteers of all ages. On returning to Houston, Lucy worked in Hermann Park, Centennial Gardens where she tended the Arid and Woodland Gardens. She left the park and moved to Spain for three months where she lived with a Spanish family and volunteered at Santa Clara Primary School. She was able to practice her Spanish, which she continues to use with friends in Houston. After traveling in Europe, Latin America, and the United States, she still feels Western North Carolina is one of the most beautiful places in the world. She is looking forward to moving back to North Carolina and working with children in The Great Smoky Mountain National Park. In her free time, she loves to swing dance! Erica grew up in a small, one-red-light town, called Great Falls, South Carolina. She was involved in softball, dance, and theater, but always enjoyed being outside as well. She left after high school to attend and graduate from Northwest Missouri State University with a Bachelors of Spanish and Broadcast Journalism. After college Erica served as an AmeriCorps*VISTA member at a conservation organization in Spartanburg, SC and was the VISTA*Leader through United Way of the Piedmont for her second term. She absolutely loved her experience with VISTA and is excited to be a part of the AmeriCorps family again. Erica has traveled all throughout Mexico, volunteered in the Dominican Republic for 5 months at an orphanage teaching English as a Second Language to the kids there and in the community, and recently traveled to Patagonia, Chile to work on an organic farm through Conservacion Patagonica. Erica recently started her own small micro-farm named Bearded Birds Farm which is located in Saluda, NC. She is excited about serving with AmeriCorps again to better understand the needs of her farming community, and be able to build meaningful relationships through her term to bring more resources to her local farming family. When Erica isn’t busy volunteering in the community she enjoys traveling, road-trips, her two pups, backpacking, cooking good food for people and whitewater kayaking! Robin Schultze was born in Murfreesboro, Tennessee but was raised in Southeast Georgia within an old cinder block house built by his great-grandparents (a convenience store that they ran until it was shut down in the 1960s–for selling alcohol on Sundays). He received his Bachelor’s from the University of Georgia in 2015 (and remains an avid Dawg fan). He also recently completed a Master’s degree in conservation ecology and environmental planning from the University of Michigan (and hopes to never spend another winter in the Midwest). His principal interests lie in land management: more specifically land-use planning and ecological restoration. Robin will be serving as the Trails Coordinator at the City of Lake Lure and is excited to work within the community-driven trails network. In his spare time, you’re likely to find him biking, learning new trees, loitering in bookstores, riding public transit in new cities, and watching the Dawgs win another SEC championship. Growing up in a suburb of Boston, Julia got her nature fix from the woods in her backyard and eventually graduated with a degree in Forest Ecology and Conservation from the University of Massachusetts Amherst. Before moving to North Carolina, Julia worked as a forester with the State of Vermont, a Trail Crew Leader with the Appalachian Mountain Club in New Hampshire, and an AmeriCorps crewmember with the Southwest Conservation Corps in Colorado. Julia will be serving as an Outdoor Education Instructor with Mountain Roots and she is thrilled for the opportunity to help foster a love and understanding of the natural world with young children. In her free time, she loves cooking, hiking, and listening to live music. Brittany Watkins is native to Western North Carolina. She grew up hiking all over the Blue Ridge Parkway and started backpacking through Pisgah National Forest and surrounding areas during high school. She attended the University of North Carolina at Asheville and graduated with a Bachelor’s in Literature & Environmental Science. Before graduating college, in 2015, she served as a crew member for North Carolina’s Youth Conservation Corps and helped to restore a hiking trail in Boone. It was after this experience that she began to feel passionate about helping to conserve the beautiful and diverse ecosystems of Western North Carolina for this and future generations. 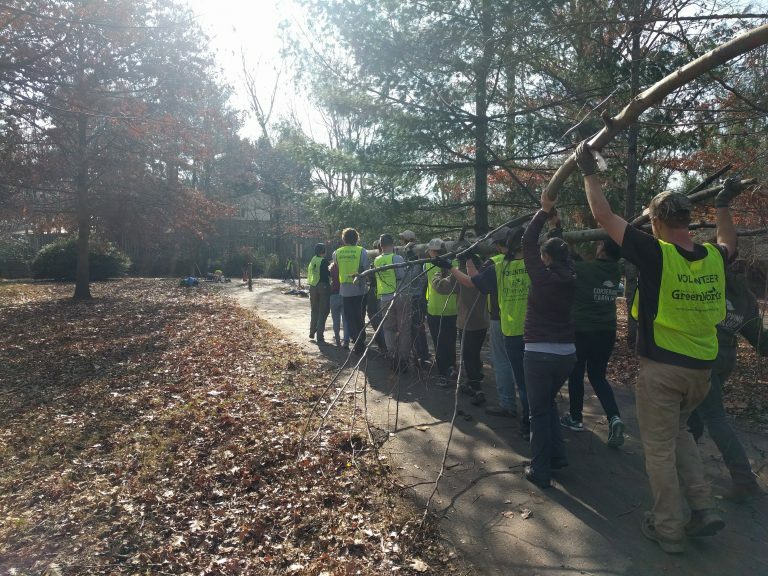 She is very excited to be working with AmeriCorps and Foothills Conservancy to help protect and sustain some of North Carolina’s beautiful landscapes. Although Natalie Willmschen was raised in the suburbs of Raleigh, that didn’t keep her from discovering a love of nature. From exploring nearby creeks to climbing up way too high in trees, she found an intrinsic motivation to care for the environment around her. Visits to science museums as a child also helped to foster that love of being in nature into a love of learning about nature. Inspired to pass on that passion to others, Natalie found a way to cultivate those experiences at Appalachian State University where she received a B.S. in Sustainable Development with a concentration in environmental studies and a focus in conservation and outreach. After working in environmental education in museum settings at the North Carolina Museum of Natural Sciences and the North Carolina Museum of Life and Science, Natalie is excited to serve as the Education Coordinator for RiverLink. In this position, she hopes to be able to learn more about Western North Carolina and the natural beauties found within it and also help others to do the same. When not working, you can find Natalie in a good relaxing spot outdoors, painting, dancing, visiting animal shelters, and eating good food.